MDF is a type of hardboard, which is made from wood fibres glued under heat and pressure. MDF has many advantages. It is dense, flat and stiff and does not have knots. This board is made from fine particles and therefore the surface grain is almost invisible. Thus it can easily be painted to produce a smooth quality surface but also cut, drilled, machined and filed without damaging the surface. MDF may be glued together, painted, varnished, veneered and laminated to achieve a different finish. There are 3 types of MDF: standard MDF, MDF which is pressed together densely and moisture resistant MDF. 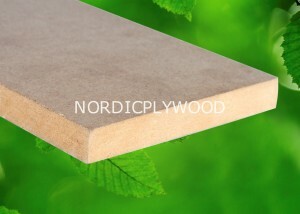 Europlywood offers all types of MDF boards in wide variety of thicknesses, sizes and colors. MDF is mainly used to build furniture such as kitchen cupboard doors, tables etc. This material is also used in construction, carpentry and packaging.